Travel to Bloomington Indiana and enjoy everything that the Courtyard Bloomington has to offer. 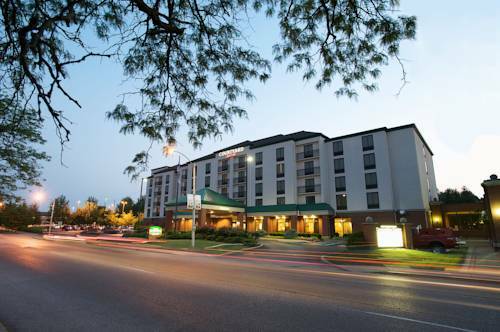 Our hotel, in downtown Bloomington, IN, is minutes away from the center of campus at Indiana University, within walking distance of Memorial Stadium and the Assembly Hall. Along with the campus access, we are close to all of Bloomington's downtown restaurants, shops, and businesses. The Marriott Courtyard hotel is also next door to the Monroe County Convention Center. We're also a great home base if you want to explore the recreational possibilities of nearby Lake Monroe, Indianas largest lake, Brown County State Park, and the Crane Naval Base. Our rooms offer 42 inch High Definition LCD televisions, spacious work desks, luxurious bedding, complementary wireless Internet, coffee, and morning newspaper. We also feature an indoor pool, whirlpool, and a well-equipped fitness room. Whether your stay is for business, visiting the university, travel, or recreation, the Courtyard Bloomington is the ideal place to stay. Palooka -- a dumb but honest boxer -- was the most successful sports comic strip ever. He had nothing to do with Oolitic; his statue was created to promote the local limestone industry. America's hard luck spaceman finally got some recognition, but only after he was dead.